It seems not only the Republicans have a beef to settle since the Obama administration decided Wednesday to join two ongoing suits against voting laws in Wisconsin and Ohio, according to the AOL article, Obama Administration Joins Suits Against GOP-Backed Voting Restrictions In Wisconsin, Ohio. In the filings, the Justice Department argues that a federal judge was right to strike down Wisconsin’s voter ID law and Ohio is incorrectly interpreting its duties under the Voting Rights Act provision. Attorney General Eric Holder explained the filings in an interview with ABC earlier in the month saying in a statement Wednesday that they “are necessary to confront the pernicious measures in Wisconsin and Ohio that would impose significant barriers to the most basic right of our democracy. These two states’ voting laws represent the latest, misguided attempts to fix a system that isn’t broken. These restrictive state laws threaten access to the ballot box. The Justice Department will never shrink from our responsibility to protect the voting rights of every eligible American. And we will keep using every available tool at our disposal to guard against all forms of discrimination, to prevent voter disenfranchisement, and to secure the rights of every citizen.” The Justice Department in an amicus brief filed in the 7th U.S. circuit Court of Appeals argues a federal judge correctly decided that Wisconsin’s voter ID law violated Section 2 of the Voting Rights Act due to its discriminatory impact on black and Hispanic voters and violates the 14th amendment by placing unjustified burden on a large group of voters. In addition, DOJ lawyers argue that Ohio is mistaken about its duties under section 2 of the Voting Rights Act. In the year since the Supreme Court killed a key provision of the Voting Rights Act preventing certain states from changing their voting practices without clearance from the DOJ or federal court, the Department of Justice has used another portion of the act to oppose voting laws in North Carolina and Texas which are ongoing cases. In Wisconsin, the state is appealing a federal judge’s decision to strike down a GOP backed law imposing ID requirements on voters in the state, while the DOJ’s filing encourages the appeals court to look at the “totality of circumstances,” including examining whether “social, political, and historical conditions in Wisconsin hinder minorities’ political participation.” In Ohio, civil rights groups are challenging a law passed by the Republican led legislature earlier this year to eliminate a six day period for voters to register and cast an early ballot at the same time. Connected with a suit filed b the Obama campaign leading up to the 2012 elections, a federal judge ordered Republican Secretary of State Jon Husted to restore early voting o the final three days ahead of the elections. However, the lawsuit DOJ got involved in Wednesday revolves around cuts made earlier this year which brought the total number of early voting days to 29 from 35. As the bickering seems to be at an all time high in Washington, the U.S. economy certainly reflects the lack of action and inappropriate spending done by government. While the U.S. economy has changed for the good and appears to be on an upswing, federal government spending seems to alway be the giant turd in the economy’s punch bowl, Mark Gongloff reports, The U.S. Government Has Hurt The Economy In 11 Of The Past 12 Quarters. The Bureau of Economic Analysis reported on Wednesday that the U.S. gross domestic product grew at a 4 percent annualized rate in the second quarter which has drastically increased from a 2.1 percent GDP collapse in the first quarter. Everything was up in the quarter including consumer spending, business spending, housing, imports and exports, but federal government spending fell for the 7th quarter in a row. In fact, federal spending has cut into the GDP 11 out of the past 12 quarters meaning the U.S. government has dragged the economy for the past three years coinciding with congressional Republicans holding the government hostage in exchange for austerity measure. The big spending drags, according to Gongloff, began hitting the economy in the fourth quarter of 2010 when Republicans won control of the House of Representative which set the stage for the budget fights to come. However, all of this could change a month from now, but one thing remains constant which is the drag of weak federal spending. The Iraq wars, Afghanistan and first Persian Gulf 1990s costs $12 billion a year and total so far at $50 billion since 2003 not including medical car other benefits provided to veterans which is likely to grow. The Vietnam War costs $22 billion a year 40 years after the conflict and payments are rising as new ailments are added such as diabetes and heart disease. A congressional analysis estimates the total cost of fighting the war was $738 billion in 2011 dollars and the benefits for veterans and families has cost $270 billion since 1970 according to AP calculations. World War I which ended 94 years ago has cost$20 million every year while World War II cost $5 billion. The Korean War costs appear to be leveling off at $2.8 billion per year. Of the 2,289 survivors of WWI, one third are spouses and dozens of the are over 100 years old. There are 10 living recipients of benefits tied to the 1898 Spanish American War costing $50,000 per year and the Civil War payments are going to two children of veterans each $876 per year. 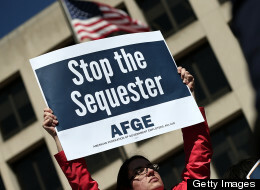 Sequestration 2013: When will it end? Sequestration 2013: With Cuts In Place, Obama And GOP Brace For Next Fight. To all my readers, I find it important for everyone to inform themselves about the actual sequester with an official document sent to Congress as a direct result of Congress and the President’s inability to reach a decision to avoid the sequester that has now gone into effect on March 1. There is a lot of misinformation going around through various groups so I decided that the actual facts might be nice, then let you the reader decide what is truth. Since both parties the President and Congress refuse to come to a decision on Saturday to avoid sequester, we as a country now face the consequences through automatic spending cuts of $85 billion. Even with last minutes talks and no deal, the sequester which is outline in the official document below has gone into effect with the stroke of Obama’s pen. There are no signs that either group will budge as the Republican refuse any deal with more taxes and Democrats will not do a deal without it. Both parties lay the blame on the other for damages the cuts might inflict which are across the board. In the words of Obama on his weekly radio and internet address, “None of this is necessary…It’s happening because Republicans in Congress chose this outcome over closing a single wasteful tax loophole that helps reduce the deficit.” The president also commented that the cuts will cause ripples across the economy the longer they stay in place and could cost more than 750,000 jobs not to mention disrupt the lives of middle class families. The next major battle for both will be to negotiate a plan to fund the government beyond March 27 or possibly face a government shutdown and another debt ceiling clash in May.